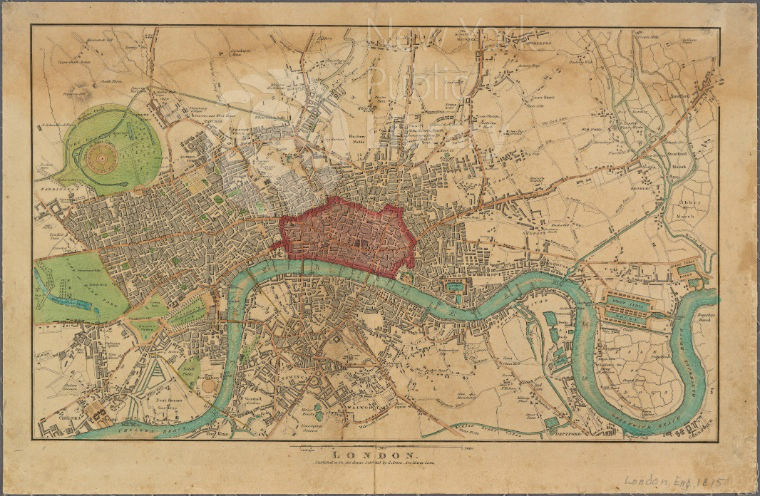 A map of 1815 London, England, published by “G. Jones.” The map is part of the digital collections of The New York Public Library. This map of London, published in 1815, represents the large, bustling capital of England. Today, London is the metropolitan cultural center of Britain,1 but in the early 19th century, it was a city of the poor working class.2 During this time, renowned authors such as Jane Austen, Elizabeth Gaskell, and Charlotte Bronte were writing, setting their works in the London depicted in this map. The London that they knew was far different from that of today. This map depicts a city rich in history, with still-relevant main streets, docks, and landmarks that currently remain. It also captures the London that has been portrayed by these and other Napoleonic and Victorian writers: a smoggy and sooty city rife with poverty and distress. For an artifact that depicts such a significant era, there is no apparent information available about the cartographer of this map. It was published by “G. Jones,”7 an elusive and mysterious figure. Nevertheless, G. Jones has provided viewers with a visual depiction of a city that can help them understand the cultural context and significance of this map. This artifact represents Vincentian values because of the important moment in history that it depicts. The values of truth, respect, and service are all relevant to this map. The map represents truth by portraying the place where so many died in poverty in the 19th century. It brings awareness to those who have suffered and inspires thoughts of those who may experience similar hardships in the present. Respect is significant to this map, as it reminds viewers to respect the memory of those who died in poverty. This map, by calling on others to remember these conditions, inspires service. By depicting the London that was filled with workhouses, places which had horrible conditions and were not sufficient to save the working class from living on the streets,8 the London whose streets were filled with beggars, many of them children,9 and the London that was suffocating from inequality, this map can encourage viewers to look for similar conditions of poverty that still exist in the world and to strive to improve them. 1. Hugh D. Clout, Blake Ehrlich, and Michael John Hebbert, “London.” In Encyclopedia Britannica Academic Online, accessed March 18, 2016. 2. James M. Bergquist, “Industrial Revolution and Emigration from England: 19th Century.” In Daily Life through History. ABC-CLIO, 2010-. Accessed March 18, 2016. 3. Heather Henderson and William Sharpe, The Longman Anthology of British Literature. Vol. 2B, The Victorian Age. (New York: Longman, 2010). 4. Henderson and Sharpe, The Victorian Age. 5. Joyce E. Salisbury and Andrew Kersten, “Class and Caste Systems in Victorian England,” Daily Life through History. ABC-CLIO, 2010-. Accessed March 21, 2016. 6. L. D. Schwarz, “The Standard of Living in the Long Run: London, 1700-1860,” The Economic History Review 38, no. 1 (1985): 24-41. 7. “London,” The New York Public Library, http://digitalcollections.nypl.org. 8. Oxford Dictionary of British History, s. v. “Workhouses,” accessed March 21, 2016, http://www.oxfordreference.com.jerome.stjohns.edu:81/view/10.1093/acref/ 9780191758027.001.0001/acref-9780191758027-e-3747?rskey=6AH4Cy&result=3778. 9. Tim Hitchcock, “Begging on the Streets of Eighteenth-Century London,” Journal of British Studies 44, no. 3 (2005): 478–498. Angel, Christine M. Information representation through the Vincentian lens of transparency: providing the under and misrepresented with a voice within our cultural heritage records. 2013. Retrieved from https://docs.google.com/document/d/ 1VkY3xbRv1Ikuny5LApVmVWmSiZ81OTtUyJ6aSl_I3xo/. Bergquist, James M. “Industrial Revolution and Emigration from England: 19th Century.” In Daily Life through History. ABC-CLIO, 2010-. Accessed March 18, 2016. http:// dailylife.abc-clio.com.i.ezproxy.nypl.org/. Clout, Hugh D., Blake Ehrlich, and Michael John Hebbert. “London.” In Encyclopedia Britannica Academic Online, accessed March 18, 2016, http:// academic.eb.com.jerome.stjohns.edu:81/EBchecked/topic/346821/London. Henderson, Heather and William Sharpe. The Longman Anthology of British Literature. Vol. 2B, The Victorian Age. New York: Longman, 2010: 1045-1073. Hitchcock, Tim. “Begging on the Streets of Eighteenth-Century London.” In Journal of British Studies 44, no. 3 (2005): 478–498. doi:10.1086/429704. Jones, G. “London.” In The New York Public Library Digital Collections, accessed March 10, 2016, http://digitalcollections.nypl.org/items/b4386e91-e142-d815-e040-e00a1806761f. Oxford Dictionary of British History, s.v. “Workhouses,” accessed March 21, 2016, http:// www.oxfordreference.com.jerome.stjohns.edu:81/view/10.1093/acref/ 9780191758027.001.0001/acref-9780191758027-e-3747?rskey=6AH4Cy&result=3778. Salisbury, Joyce E. and Andrew Kersten. “Class and Caste Systems in Victorian England.” In Daily Life through History. ABC-CLIO, 2010-. Accessed March 21, 2016, http:// dailylife.abc-clio.com.i.ezproxy.nypl.org/. Schwarz, L. D. “The Standard of Living in the Long Run: London, 1700-1860.” In The Economic History Review 38, no. 1 (1985): 24-41. doi:10.1111/j. 1468-0289.1985.tb00356.x. This entry was posted in New York Public Library: Map Division and tagged Academic Service-Learning, G. Jones, Lionel Pincus and Princess Firyal Map Division, London Inequality, Map of London, Maps of Europe Collection, New York Public Library. Bookmark the permalink.